On Tuesday 22nd October my exhibition opens at Lincoln Joyce Fine Art in Great Bookham. The watercolours cover a wide range of subjects, from mountains and pastoral scenery to coastal scenes. It’s many years since I featured any of the lovely old sailing barges in a collection, so I’m pleased to say that I’ve included some in this one. The image shows a barge moored on the Blackwater near Heybridge Basin: the original sketch was carried out on a really gloomy afternoon not long before the Essex monsoon arrived. As so often happens, I tend to paint a different sky in the finished work, and have many sketches and photographs of skies for reference. In this instance I felt a brighter sky with an atmospheric distance would work well. The blue part of the sky was done with coeruluem blue, while the main clouds are a result of mixing French ultramarine and cadmium red, which was also used in the distant shore. However, skies are not just about colour and atmosphere. Giving the compositional aspect of a sky some consideration can really enhance your painting, and here I have arranged the cloud shapes to lead towards the barge, which is, of course, the centre of interest. Note that even the soft-edged cloud in the lower right arrows its way towards the prow of the vessel. The soft edges were created by running the colour into damp areas, wet-in-wet. Also, the orangey-yellow area in front of the mainmast with its associated reflection in the water, helps to draw the eye towards the barge. You can learn more about skies in my book Skies, Light & Atmosphere, available from my website If you would like to attend the preview of the exhibition on Saturday 19th or Sunday 20th October, or attend the watercolour demonstration and talk on the Sunday in the Barn Hall opposite the gallery, then please ring the gallery on 01372 458481 The gallery will be open from 10am to 5pm. Lincoln Joyce Fine Art is at 40 Church Road, Great Bookham, Surrey KT23 3PW The exhibition ends on 9th November. 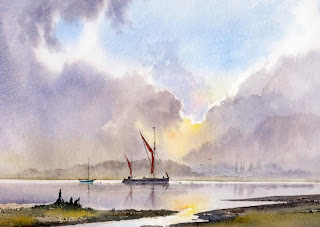 This entry was posted in David Bellamy and tagged composing skies, painting old sailing barges, watercolour skies by David Bellamy. Bookmark the permalink. Dear David Bellamy: I wish I was closer so as to be able to take advantage of this great exhibition. I refer to your several books and DVDs constantly and derive a lot of inspiration from them. Hope to sign up for a workshop in 2014… Cheers from Meath Conlan in Perth, Australia.